When you are looking to make your patio more inviting and casual, one of the best furniture choices is bamboo. Bamboo tends to give a relaxed feel, and it is lightweight to be moved around as you need, while still being durable enough to stand up to the elements. The problem is that if you do not take care of your bamboo furniture, it will degrade and start to look bad fairly quickly. Fortunately there are three things that you can do that will really make your furniture look good for a long time. One of the biggest problems with bamboo furniture is that it is easily scratched, and the more scratches the furniture has, the worse it will look. Even dust can be enough to cause noticeable damage to bamboo, so you will want to take the time to dust the furniture on a regular basis, especially during those times of the year when you may not be using the furniture as much. As time goes on you will find that you need to do a little heavier cleaning, and that will mean washing the furniture with soap and water. Again you need to be careful about scratching, and a soft cloth or sponge is ideal for cleaning the bamboo. You will want to be sure that the cloth or sponge is wrung out before you start to clean, otherwise you run the risk of spotting the bamboo or causing damage from the excess water. If you see some kind of food or drink spill on the furniture wipe it up right away because bamboo is extremely susceptible to deep and permanent stains. Eco-friendly furniture helps to protect the environment, but the furniture often does not have the same strength or structural integrity that other furniture has. Bamboo furniture can lose its shape or sag if it stays wet for too long, so after a heavy rain or a washing you should plan to dry the furniture. The easiest way to do this is to just put the furniture in some partial sunlight or in the shade so that the moisture can dry naturally. You do not want the furniture to go in direct sunlight and you do not want to let it stay in the sunlight for an extended period of time because that will cause irreparable damage to furniture. You can use a hairdryer if you need to dry the furniture quickly, but that is something that should only be used as a last resort. Finally, you will need to do regular maintenance to keep the furniture looking its best. Damage is natural and it is something that you will have to deal with at some point in time. With fine grained sandpaper you can extend the life of your furniture for years by clearing up the rough spots and keeping the furniture nice and smooth. Oils are also vital to maintaining the appearance of bamboo. Linseed and flax seed oils will keep up the luster of the bamboo and make it shine just like new. If you are going to apply oil to your bamboo make certain that you follow the rules for washing it and use only a soft cloth or a soft sponge. Do not let the oils pool and wipe away excess moisture to protect the furniture. 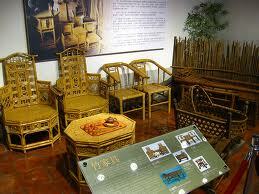 Bamboo furniture looks great and it can last you and your family a very long time, if you are willing to do what it takes to take care of the furniture. What it really comes down to is keep it clean, keep it dry and keep it maintained. If you do those three things, you will enjoy your furniture for years. I am Helen Stevens and I have been an owner of bamboo furniture for about six years. There are so many different choices for bamboo patio furniture and if you are interested, Bambooki has a huge selection of styles available.